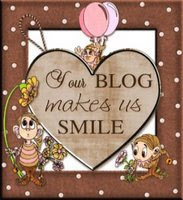 Hello everyone, hope you all had a lovely break over Easter, and thank you for all your comments and emails - they are much appreciated, as was this lovely Blog award from Hazel..thank you Hazel! Time constraints at the moment mean that I am not going to pass it on to five specific blogs though...so, instead, I'd rather nominate all of you who read my ramblings and who have a blog yourself - hope that's okay, as I really enjoy reading all of them! Well, workshops are the theme at the moment. Hello, first of all, to the ladies who were with me at Crafts U Love in Horley on Saturday. You all worked really hard and I hope that you managed to finish those boxes! The ladies made pop up cards, secret message cards, Owl and tree cards and they also made a start on some boxes - so we got rather a lot done! I really enjoyed spending time with you all and look forward to coming down there again in the not too distant future. My train journey home took forever, but I had a lovely surprise when I got in as David had done some clever swapping around, fixing and re-arranging to get my storage more organised for me after my drawer disaster (ooh er!) last week. What a star! On Friday I will be in Craft Lland in Llandudno (clever use of wordplay eh?) and at Crafty Co Uk in Liverpool on Saturday, where I'll be demonstrating Sakura pens on both days. So do come along if you are in the area. I will be at Dawn Bibby's studio on Sunday where I'll be teaching a workshop from 1pm - 4pm. The theme is Novelty Cards for Children and there are still a few places left if anyone is looking for a creative afternoon this weekend. Just call Topaz if you are interested in coming along. I will post picture of the cards next week. As many of my colleagues are having clear outs of their craft rooms at the moment and selling items on Ebay, I thought I'd join in! However, being a bit wary of Ebay and such like, I thought I'd cut out the middle man and do it via my blog. So, I will be making a list of items that I'll have for sale and will let you know when it is ready then, if you'd like to take a look, just email me and I will email the list by return...I'll have to restrict this to UK only because of postage I'm afraid. Anyway, watch this space for the big clear out! There will be some bargains I'm sure! Yipee, a sale. I too am a bit wary of Ebay. some of the stuff is ok but can be a bit of a hit or miss. Sounds like you had fun at the weekend. You are a well travelled crafty peep. Can I book a list please. I need to spring clean my workroom too. Trouble is I find things to sell then have second thoughts and put them back again!! !